Seniors are often frustrated by the fact that there are not enough ramps in or around buildings for their ensured mobility. It makes it difficult to navigate when a wheelchair or scooter cannot get over a bump or stair, rendering an entrance or establishment inaccessible. That’s why we’ve taken the time to put together three of the best portable wheelchair ramps for 2018. An affordable, durable threshold ramp that you can take with you anywhere. Anti-slip, high traction surface. Holes punched in top corners for easy installation. Hardware provided to secure ramp to surface. If you’re looking for a threshold ramp to use in any situation, this may be the ideal option. It has a limited threshold but is useful for helping seniors get over bumps and lips smoothly. This threshold ramp is small enough and light enough for caretakers or seniors to load into their car or van with minimal hassle. 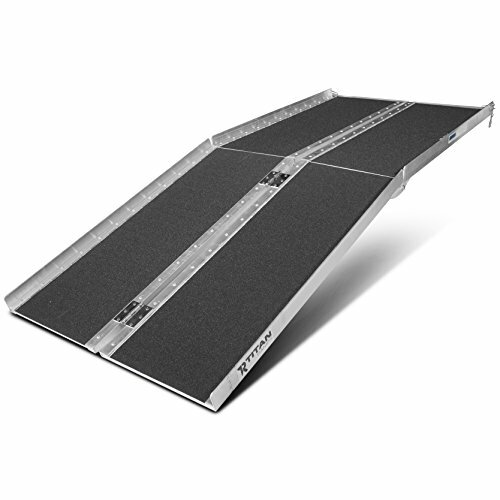 While many mobile seniors and/or caregivers can “hop” their wheelchair over minor threshold disturbances, this ramp can make all the difference, with a non-skid surface that offers solid traction and just a slight slope, it’s easy to navigate. With a lifetime limited warranty and aluminum construction, this product is built to last. A bit pricier and bulkier than other portable options, but is excellent for stairs. If you or the senior in your life are seeking a portable wheelchair ramp for stairs, and/or attempting entrance to porches, curbs, landings, steps or transport vehicles, Titan Ramps’ mobility ramp is worth considering. The ramp is an astounding six feet long, allowing seniors to climb and descend slopes easily. We also love the ramp’s black non-slip traction grip. One of the best things about this ramp is it folds in half, making it easy for caregivers to transport from one location to another or store it away when not in use. This portable wheelchair ramp is easy to transport. Available in three sizes to fit all of your needs. Another excellent portable wheelchair ramp option, this piece of equipment would be useful for seniors using motorized chairs. This ramp has an incredible 800-pound weight capacity, one of the highest we’ve ever come across for a portable wheelchair ramp, resulting in durability you can count on. Seniors and caregivers can choose between ramps of three different lengths to meet their specific height requirements—two, three, or four feet—with a sufficient width for most all wheelchairs. This ramp folds as well and even comes with a handle for easy carrying. Seniors and caregivers are both often perplexed when trying to find a wheelchair ramp that is portable. There are multiple options available, and it’s usually hard to determine which is best or which accommodations are most vital. Below, you’ll see some of the most common frequently asked questions regarding portable ramps so that you can make a well-informed buying decision. 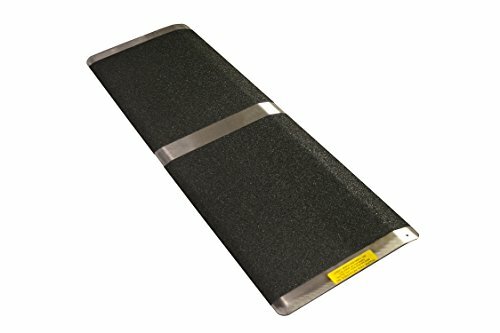 What is the Best Material for a Portable Ramp? Although you may find ramps made of various materials, the best option is aluminum. Portable aluminum slopes are both lightweight and durable. They are resistant to rust, corrosion, and other wear and tear. This means that caregivers can take them in and out of the car and use them thousands of times without having to worry about faulty equipment. Another material you’ll want to be on the lookout for is traction or grip tape. Manufacturers often place this tape on the top of the ramp where the wheels of the chair will roll. This allows the wheels to gain traction on the surface, making it much easier for seniors to maneuver up and down the ramp. This also helps in wet conditions, such as when it is raining. Can You Explain the Different Types of Portable Ramps? When browsing threshold ramps, you’ll likely come across various types. Rollup ramps are light and compact, as caregivers can unroll them and secure them to a side railing. They are typically only available in lengths of three to five feet, meaning they are best suited for handling one or two steps. Single-fold ramps are better for mid-height inclines. They maintain their length when folded. Multi-fold slopes can unfold to a length of approximately 12 feet. These are the most massive portable ramps on the market, but they are also the longest. However, because of their size, these ramps can bear heavy wheelchairs and can help seniors cross many stairs. Lastly, temporary ramps are most convenient, as users can install into a doorway instantly. They can be permanent or semi-permanent. 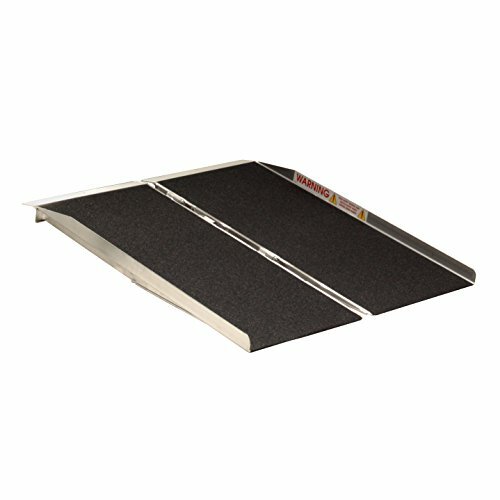 Can I Leave A Portable Ramp in Place? Yes! If a senior around on his or her own, they may like to explore and wheel themselves around freely. You can install a portable ramp permanently so that they can clear stairs and other obstructions quickly and safely. Many of these ramps come with instructions and guides for permanent installation. If you ever need to move the slope, it should be easy for you to do so. How Much Do Portable Ramps Cost? Portable ramps can start as low as $25 and climb from there upwards of a couple of hundred dollars. The cost of the equipment depends significantly on the type that you choose. However, those buying the ramp should remember that quality options made of aluminum are an investment that can last for the rest of your senior’s life. It may be worth your while to ensure you buy a quality product. Will Ramps Work at Any Height? No. The American with Disabilities Act recommends that there is a 1:12 ratio when using a ramp, which means that there is at least 12 inches length for every one inch of height the ramp gains. This recommendation is intended for both home and commercial ramps. Having a ratio higher than this is ok. For instance, your ramp can run 13 or 14 inches and only gain an inch of height. That is suitable. Anything that exceeds the ADA recommendation could put seniors at risk. It could be challenging for them to maneuver themselves a steep slope. If they are going to down a steep decline, they could gain too much momentum and lose control of their wheelchair, potentially risking severe injury. Be sure to measure the height of the location where you wish to have the ramp. Many seniors have difficulty maneuvering themselves in their chair, which makes it difficult to clear lips and stairs. It’s always best that caregivers have portable wheelchair ramps on hand to help ease this process. Caregivers should put careful consideration into which slope is best for the senior in their life. We feel as though the three options we’ve provided will help solve many problems in a pinch.